It’s hard to talk about San Diego without talking about the weather – it’s perfect. We initially thought to spend 2-3 days here, but decided on 7. Taking it easy, we continued to knock off the travel fatigue by way of pool time, Mexican food consumption, and workouts on the beach. Switching it up a day, we ventured over to the San Diego Zoo Safari Park. Visiting the park on a weekday during school time made for an ideal trip – E and Lil D had the animals to themselves. So much so that a lioness was obsessed with Lil D and would move around and get agitated every time he made his way to the glass. She (the Lioness) must have had good taste in my boy. After San Diego, we officially began the long turn east for home. Google maps says the drive from California to Maryland will take 38 hours, but we are taking it slow and giving ourselves about a month and a half to make our way cross-country. First stop on our eastward trip, Vegas Baby. Or I should say, Vegas with babies. Vegas isn’t the first place one thinks of when finding a destination for a 4 and 1 year old, but it was a middle point on our way to Zion National Park in Utah. As such, we made our home at the MGM Grand for a couple wild nights. Before making it to the MGM, we had to find a place to store Tin E as there was no way she was going to fit in the parking garage. This was an adventure to say the least. 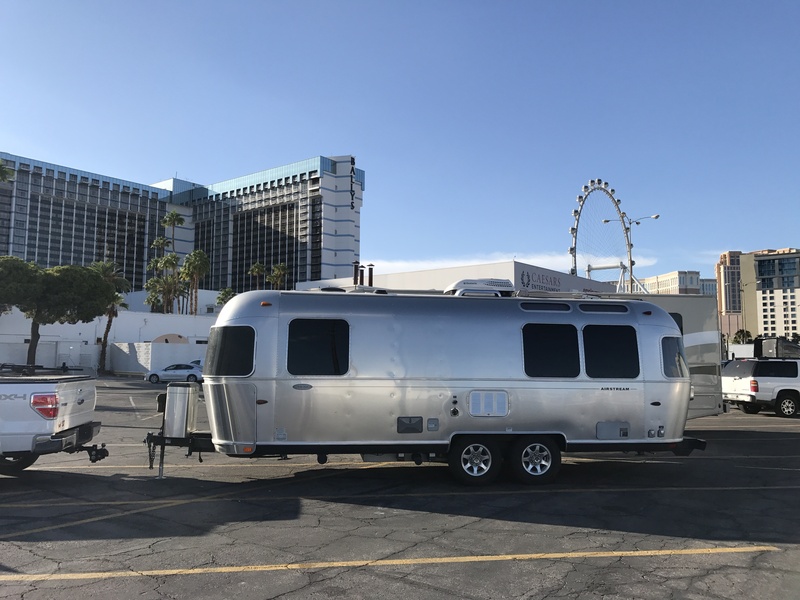 Driving a 25 foot Airstream down the Vegas Strip is not the best supercar for getting looks, but it sure attracted attention! On our way to finding the parking lot (a hidden area behind Bally’s), we accidentally drove through the valet for the casino. That was fun, especially considering how tight the roads were and how J had to get out of the car to move a gigantic parking sign so we could make it through. The valet was nice enough to tell us where the parking lot was and we were outta there leaving a bunch of confused people in our wake. After depositing Tin E in what appeared to be a safe spot, and squeezing Gringo the truck in the parking garage, we made our way through the MGM. E got the itch to play slots and me being the responsible parent decided that $5 at the slot machine with the princess, diamonds, and dogs on it would be a good daddy-daughter bonding experience. First spin on the slot machine and we’re a winner! We bet $1 and won .08! Yup, 8 cents. As soon as you could say “winner winner chicken dinner,” a very polite casino employee came over and said that kids were not permitted to be near the machines. If kids aren’t allowed to play, then what demographic is interested in the slot with a princess, diamonds and dogs on it? Our first Vegas night was sleepless for all the wrong reasons. Lil D apparently wanted to hit the clubs because he was an angry teething elf for most of the night. We finally got him to sleep somewhere around the 3:00am timeframe and did our best to get some rest. At 5am, there’s a knock at the door. Then another knock and another. Thinking there’s someone drunk and at the wrong room, I do my best to yell (without waking the kids), “wrong room!” However, the knocks keep coming. I yell again, “you’ve got the wrong room.” Still knocking. At this point, I’m freaking out that this drunk fool is going to wake up my kids, I jump out of bed to the door and look through the peep-hole to see a very attractive late twenty-something girl. Still fired up, I say through the door, “you’ve got the wrong room!” to which the girl responds in an Eastern European accent, “open the door, this is my room. I’m here to come into your room with you.” Hmm, that wasn’t the reply I was expecting. Did Jenny hire a nanny to watch over the kids without telling me? Oh wait, she isn’t what I think she is, is she? Ohhhh yes she is! Well my Julia Roberts in Pretty Woman wannabe, unless you want to change professions and call yourself Mary Poppins, you’ve definitely come to the wrong room. The 10th time must have been the charm, because she finally relented and decided to play spin the bottle on another unsuspecting door. After trying to sleep for another couple of hours, we got out of bed wishing our Eastern European friend would come back and watch our kids so we could hit the pool sans kids. Alas, we had a good day swimming in the Lazy River at the MGM (great for kids – no kidding) and then people watching around town and the casinos. That night we were the only people in bed by 9:30 and Pretty Woman decided not to return. Hitting Vegas with kids was actually a good time. One odd thing was that lots of drunk people wanted to say hello and/or play with the kids. This I couldn’t understand. How drunk do you actually have to be to WANT to play with kids while you’re in Vegas. I’ve been known to have more than the legal limit of alcohol once or twice and not once did I think, “I really want to engage in conversation with that 4 year old over there.” Strange. Kids in Vegas Bonus – when you have kids you can’t spend (lose) your money at the casinos. We walked away losers of $4.92 and didn’t have a single drop of alcohol. Extra Bonus – Tin E was waiting for us when we got back and wasn’t given away as a slot prize.